As UCLA’s chief executive officer, Gene Block oversees all aspects of the campus’ three-part mission of education, research and service. 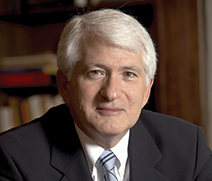 A champion of public universities, Chancellor Block has served on several leading national associations and advisory boards, including the Association of American Universities, the National Collegiate Athletic Association, the Association of Public and Land-grant Universities and the Association of Pacific Rim Universities. Among the prestigious honors Chancellor Block has received are the Los Angeles NAACP Foundation President’s Award and The Friends of the UCLA Semel Institute for Neuroscience and Human Behavior Visionary Award. He also holds an honorary professorship at Zhejiang University in China. Dr. Block became chancellor of UCLA on August 1, 2007. Previously, he served as vice president and provost of the University of Virginia, where he held the Alumni Council Thomas Jefferson Professorship in Biology and directed the National Science Foundation’s Science and Technology Center for Biological Timing. He also headed an NIH graduate training program aimed at increasing the number of scientists from underrepresented groups. Chancellor Block joined the faculty of the University of Virginia in 1978. He served as vice provost for research from 1993 to 1998 and then as vice president for research and public service until his appointment as vice president and provost in 2001. A native of Monticello, New York, Chancellor Block holds a bachelor’s degree in psychology from Stanford University and a master’s and Ph.D. in psychology from the University of Oregon. He completed a postdoctoral fellowship at Stanford, studying with Colin Pittendrigh, “the father of biological timing,” and Donald Kennedy, who later served as president of Stanford.